For those of you not lucky enough to live in the sunny South, this is the time of year when things start getting pretty gloomy. Sure, you’ve still got your bird and deer hunting, and in a few months it’ll be ski season, but let’s face it; if you’re on this site, it’s because you’re a fly fisherman, and for many of you, it’ll be several months before you once again wet a line. Educators discuss the probability that students regress over summer break, and it may well be that snowbound fly fishermen suffer from the same effect. Luckily, a couple years back the Echo Fly Rod company came out with the Micro Practice Rod ($40), which is basically the top half of a fly rod rigged up with heavy yarn for indoor casting. Does it work? Absolutely. Is it a gimmick? Maybe, maybe not, but it’s as fun as can be, so who cares? I’ve had a Micro Practice Rod for a few years, and every winter, never fail, I break it out of storage just to feel the relaxing rhythms of fly casting when it’s too cold to actually go fishing. The rod is a tremendous tormenter of cats, so I’ll warn you to watch out if you’ve got housepets. As far as practice goes, I think it is truly useful for learning the setup moves needed in one handed spey casting. Snake rolls, Snap-Ts, and even the Double Spey can be visualized, mimicked, and understood very well with this rod, and I think it would make new spey casters better. 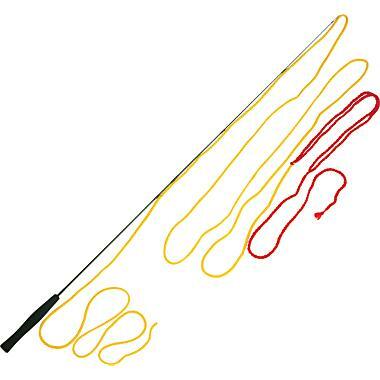 For overhead casting, it’s fine as is, but if you’re crazy enough to attach an old fly line to the back of the practice line, you can get some really surprising distances out of the rod by using the yarn as a shooting head. And, I believe, this would help new heads casters learn to deal with overhang. In short, I’m a fan, and with winter closing in, it might be time to pick up one of fly fishing’s best toys. What do you think of these yarn-based practice rods? Let us know in the Comments section.